New COMP Cams Billet Valve Covers for GM LS Engines clear all types of valve train components for GM LS engines, including shaft mount rocker systems, and provides for internal valve spring oiling. The new billet aluminum valve covers feature OE-style gaskets and hardware for superior sealing, a -16AN oil fill port for easy filling, a breather location for dry-sump oiling systems and internal baffling for an optional 3/8″ breather/vent line. The valve covers also have provisions for valve spring oil squirters to help cool valve springs and increase their life in endurance racing applications. A bright black anodized finish and stainless steel ARP fasteners offer a clean appearance. 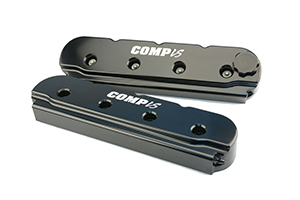 COMP Cams Billet Valve Covers work on all GM LS center bolt cylinder heads, engines with tall or shaft mount rocker arms and endurance applications requiring extra spring oiling. Coil mounting provisions are available using COMP Cams brackets sold separately.